Am I In or Out of the FEMA floodplain? Am I Above or Below the FEMA floodplain? Can I Save Money on flood insurance? Can my flood zone be changed? What do FEMA Map Changes mean for me? Know for sure, comply with federal regulations, and become risk aware. An incorrect flood zone can cost you thousands in flood insurance premiums or leave you unaware and unprotected from losses. Whether you manage thousands of properties or just your own home, you can trust a Flood Certification leader to deliver accuracy, quality, and value. If you need a flood insurance policy or you want to lower your premiums, then you need an Elevation Certificate. Our national network of state-licensed land surveyors will accurately certify the elevation of your property to comply with federal regulations and get you the lowest insurance rate possible. A FEMA Letter of Map Amendment (LOMA) corrects an incorrect FEMA map and it can get you significantly reduced flood insurance premiums. It can also remove the mandatory flood insurance purchase requirement. 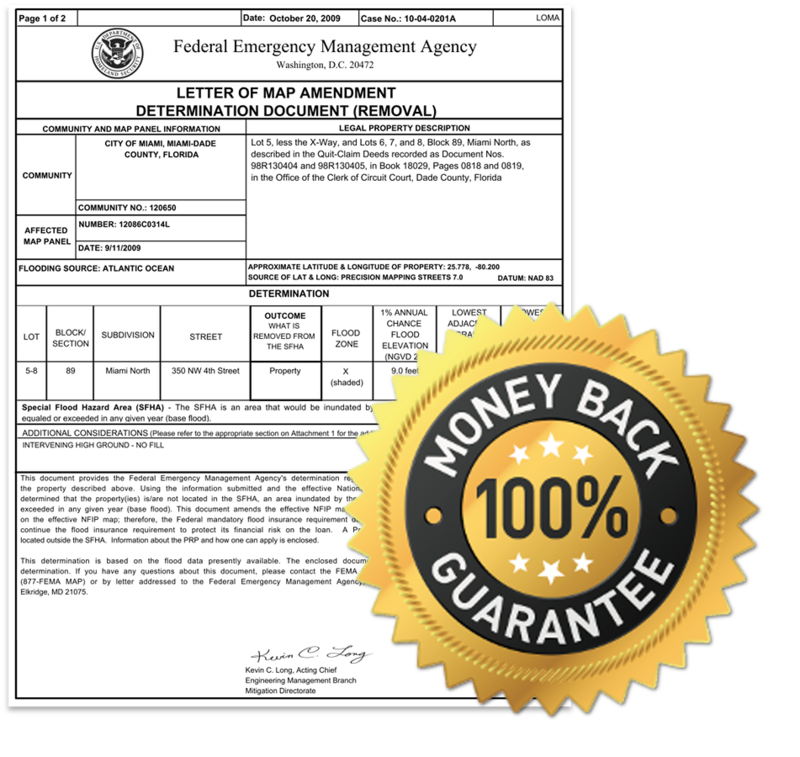 MassiveCert guarantees a LOMA approval or your money back. If you need a flood insurance policy or you want to lower your policy rates, then you need an Elevation Certificate. Our national network of state-licensed land surveyors will accurately certify the elevation of your property to comply with federal regulations and get you the lowest insurance rate possible. For Every Customer. Whether your are a NFIP Direct or WYO agent, homeowner, lender, broker, originator, Real Estate Agent, property manager, risk manager, or just want to know what the official flood zone is, we'll take care of you. Every Determination Type. We provide all of them. If you are a homeowner, insurance agent, or real estate agent you'll want a Basic or Grandfather Determination. If you are a lender, you may want a Life of Loan determination so we monitor your property for changes. We even provide custom non-guaranteed and future determinations. Unique Map Exhibits. 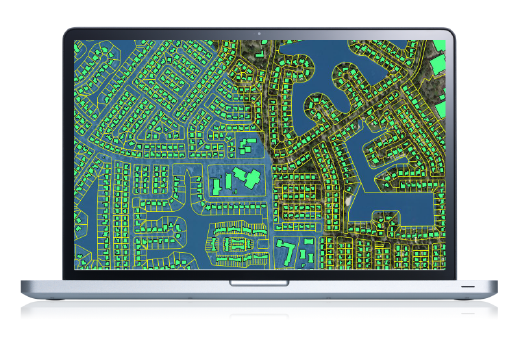 See your property on a flood map to leave no doubt about the floodplain. Loads of extras. We include more data than just the floodplain, like: Base Flood Elevation (BFE), vertical datum conversion, HFIAA Newly Mapped review, highlighted CBRA text, HMDA, the next closest flood zone, previous and future flood zones, and proximity to salt and fresh water. Endless integration. Order today from our DirectFlood platform - no contract or rep needed. Or talk to us about the web services API to integrate into your system for one-click ease. We can process a portfolio file in one shot. Or you can engage with our client-site platform for customer ordering needs. An elevation certificate is a structure-specific report created by a state-licensed land surveyor from your community. It is used to rate a flood insurance policy based on the elevation of your property in comparison to the height of flood waters. The Elevation Certificate may significantly reduce your flood insurance premiums because the surveyor is measuring the elevation, or height, of your specific property to 1/10 of a foot (that's 1.2 inches) accuracy which is far better than the FEMA flood maps. 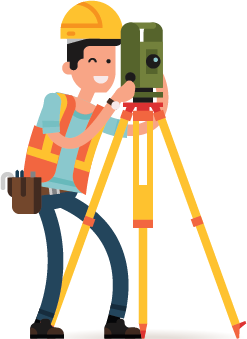 The best professional land surveyors are already in your community and MassiveCert connects you directly with them. Because of our national reach, we are able to support our local teams by staying current with all federal regulations and implementing stringent quality control. That's critical to ensure you are getting the highest quality and insurance discount you can get. Our national support team and local professionals are an unbeatable team for FEMA Elevation Certificates. A LOMA is an official FEMA review of your property on the FEMA flood maps. It's like a flood zone determination, but FEMA also considers the elevation of your property and not just the line on the map. So, if you think your flood zone is wrong, it very well might be wrong, and by knowing the elevation of your home we could change your flood zone. The LOMA is the official federal government document that will exclude you from the mandatory flood insurance requirement and fix bad flood zones. We have processed over 100,000 of these cases successfully for properties just like yours, so we know exactly how to get a LOMA for you. Guaranteed We've seen every type of property in every flood situation so you can rest assured we have the experience to correct your flood zone. If we can't get the mandatory flood insurance requirement removed with a LOMA, we'll refund our fees so there's never any risk to you.